For constipation, soak 3–6 pods (15–30mg) in 1 cup of warm water and drink last thing at night. Add a slice of fresh ginger root or 1 tsp of fennel seeds to combat griping pains caused by an increase in bowel movement. Use half the adult dose for children over 10 years. 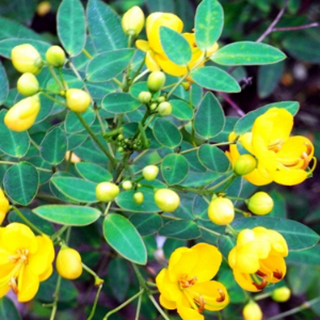 Take 5–10 drops (1/4–1/2ml) of senna leaf extract in a little water at night for constipation. Take 10–30 drops (1/2ml–11/2ml) in a little water at night for constipation. Take 1–2 tsp of granules or 2–4 tablets at night for occasional constipation. Prefers rich, moist, sandy soil in full sun. Requires a minimum of 41F (5C) to grow, but can be grown in containers in cooler regions. Sow seeds in spring and transplant to containers or final growing positions when well established, or take semi-ripe cuttings in spring. Pick leaves before and during flowering; gather pods in autumn when ripe.